Istobal’s new wash and dry tunnel T’WASH30 combines the versatility and latest technology of the M’NEX32 rollover ensuring maximum efficiency and a high throughput. 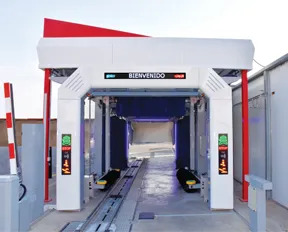 The tunnel can wash and dry up to 60 vehicles per hour with the three-brush module and up to 80 with the five-brush module depending on machine length and cycle speeds. The system can be fitted with different modules: pre-wash, wash, and dry. The tunnel optimizes water consumption, saving 10 percent compared to the previous model. The use of variable-frequency drives contributes to a considerable reduction in power between vehicles.